Bicycling can be a fun hobby, an alternative to the gym for the fitness-minded, a wallet and environment friendly commuting method, or a combination of the above. While it is usually health-positive, bicycle accidents can range in severity from simple bumps and bruises to a fatal crash. We have written numerous posts addressing the dangers posed by drivers on auto-pilot who fail to pay attention to travelers on two wheels instead of four. This danger is real and is probably the source of the majority of serious bicycle collisions. It is not, however, the only threat to riders. Bike-on-bike collisions are dangerous on their own and can also be the first incident in a chain reaction that includes a motor vehicle crash. In some bike versus bike cases, according to our Oakland bicycle accident lawyer, an injury lawsuit may be appropriate. A Saturday morning bicycle ride turned tragic, claiming a rider’s life in the Livermore area last weekend. The San Francisco Chronicle reports that fifty to sixty cyclists were riding east on Highland Road near Manning Road. Two riders collided and a third, an unidentified cyclist riding towards the middle of the group, attempted to avoid the crash by crossing over the double-yellow lines into the opposing lane of traffic. In this attempt, the third rider, identified by other cyclists as Dublin resident and high school administrator Herman Shum, was thrown from his bike and landed in the road. At the same moment, a westbound truck driver noticed the collision and braked while veering to avoid the incident. Tragically, this happened at the very moment Shum fell and the truck hit the cyclist who was later pronounced dead at the scene. In addition to the fatality, one rider suffered major injuries and one incurred minor injuries. CHP Officer Eric Anderson told reporters that both crashes, the bike-bike and truck-bike collisions, are under investigation. Police do not believe alcohol or drug use was a factor. Generally speaking, more bikes on the road means drivers are more alert and roads are safer for everyone. However, as a blog piece on the website of cycling magazine Bicycle notes, riders need to learn how to ride safely among other cyclists. This same learning curve applies to riders who are new to the world of group rides. The article lists a number of different scenarios that can result in a bike versus bike collisions. These include: Riders crossing wheels in a race or in training; A tire coming off or another equipment-based problem; Unsafe passing, including a group passing too close to a solo rider who fails to hear them approach; or A rider failing to use lights at night or violating a traffic rule, leading to a collision with another bicycle. As the recent Livermore tragedy shows, a bike vs. bike crash can also be the first incident in a chain reaction that can potentially cause multiple injuries and/or fatalities. Accidents happen, but if one rider’s negligence or carelessness leaves another rider injured or even dead, a civil claim may be appropriate. An injured rider may be able to recover for medical bills, lost wages, and other financial repercussions of the incident in addition to receiving compensation for pain and suffering via a personal injury lawsuit. When a rider is killed, the cyclist’s close relatives may have a wrongful death claim. Claims may even exist in cases where the victim signed a liability waiver. Such waivers, common in races and organized group rides, do not cover all eventualities including reckless or intentional behavior. 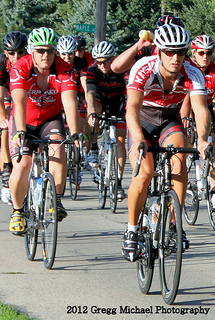 The Brod Law Firm is pro-bicycling and supports riders. Attorney Greg Brod is a member and supporter of the San Francisco and Main County Bicycle Coalitions. Our team has experience acting as a bicycle injury law firm in San Francisco and throughout Northern California and we have helped injured riders recover compensation. Whether it is a driver or another rider who was at fault, we help injured riders and their families move forward after the unexpected. Call for a free consultation.